The Best Value in Chinon? Lisini is a classic producer, both in style and in that they were one of the original 25 wineries in the Brunello Consortium. They’re known for powerful wines that see extensive aging in (large format) cask and bottle before release, which softens their textures and gives them wonderful secondary flavors. These are reference-point Brunellos that belong in the cellar of any collector—as does the Rosso, a delightful wine that’s always delicious young (which is useful as a cellar defender for the big guns). The new vintage (2012) of their top wine, the single-vineyard Ugolaia, was just given a 96 point score by Wine Spectator—perfectly timed as it arrives next week! Neal Rosenthal brings in arguably the best collection of rosé from Europe. From Pradeaux in Bandol to Peyrassol in Provence and Bagnols in Cassis, his rosés are often the defining examples of their appellations. We tend to think of Rosenthal rosé as being especially elegant and nuanced, with excellent minerality and poise. We have the first few, from fan favorites Peyrassol and Gour de Chaule, arriving tomorrow and couldn’t be more excited. The rest (Pradeaux, etc.) arrive over the next month, but these always are the first true markers of spring for us. 2015 is already shaping up to be a world class vintage in Barolo and Barbaresco (to say nothing of Alto Piemonte). Combining aspects of 2009, 2013 and 2010 these wines are powerful, flamboyant and intensely complex. From the moment we started tasting the early released Langhe Nebbiolos of the vintage, we knew this would be a year to stock up on, especially for lovers of bigger Barolo and Barbaresco wines. We’re finally at the part of the year where the real-deal releases are upon us—all the top names should be arriving at the shop over the next six months or so. Based on what we’ve tasted and read, the hype for the vintage is real and the hype is huge. If you missed out on ’10’s and ’13’s, be warned: these are going to disappear quickly as well. We have new releases from Paitin (in Barbaresco) and Cavallotto arriving early next month as well as a small allocation of E. Pira locked down for the fall. If you love any of these wines, act quickly—they’re going to be in high demand. Plus, their late-released Vecchie Vigne from ’11 arrives in May, as well! Chinon is one of the best values in wine and among Chinon producers, Baudry is tops. From the low to the high end, everything Matthieu Baudry makes is beautiful, expressive and delicious. At the higher end are his single vineyard bottlings (Croix Boissee, Clos Guillot and Grezeaux) which are all ageworthy and delicious. His lowest end wine, Les Granges, is a wonderful value bottling, as well—but to focus on the highs and lows overlooks perhaps his best value, the Domaine bottling. Situated at the highest altitude of all of the parcels, the “Domaine” is a blend of two vineyards. Most of it comes from a vineyard with limestone bedrock, which provides backbone and structure, but some comes from a more gravel heavy vineyard that always emphasizes fruit. The resulting wine is always significantly more approachable than Grezeaux or Clos Guillot, but with enough backbone to age for a decade plus in a good year like ’17. Compared to the Les Granges bottling, it shows much more noble character—this is a wine of real class and breeding. When we taste it in the lineup of Baudry wines, it always seems to be the least expensive of the high end wines, which means it’s also probably the best value of the bunch. 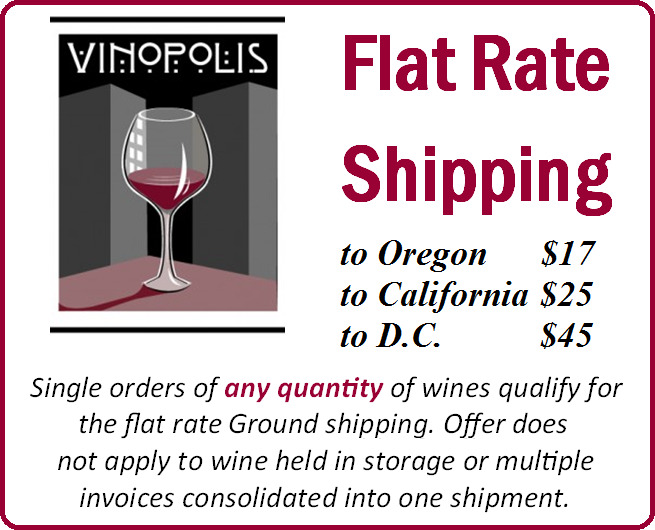 We just secured excellent pricing on a lot arriving this summer and at volumes that mean you’ll be able to stock up. Big, powerful and perfect with anything off the grill. Kabinett Riesling is perhaps the most perfect wine with spring produce. VinopolNote: Although the recent press for the Mouin-a-Vent has pushed it to the forefront of the Vissoux collection, the two Fleuries from Pierre-Marie Chemette have traditionally been the estate’s calling card. The Garants vineyard is on what the Domaine describes as “noble granite soil” and is the more structured, age-worthy of the two Fleuries (the soil has a definite Morgon influence on the wines). This is rich and structured, with some of the classic perfume of Fleurie, but also an iron-rich depth in its core. When Bea’s wines hit the shelves, the frenzy begins—especially for the flagship. Unpretentious Portuguese table reds are lots of fun. One of the best values in top-end Willamette Pinot. Montille at a great price from a great vintage. After the warm, rich 2015 and ’16 vintages, 2017 Chablis wines in general feel like a breath of fresh air—fresh, stony, seaside air. Yields were poor in ’17, but luckily for us and for the producers, the quality of what remained was superb—further proof that Burgundy can and will get better and better regardless of what Mother Nature throws its way. Stylistically, 2017 is a classical vintage with a seductive side. It’s not as bracing as 2014, but shares a similar style of fruit and degree of minerality. These are beautifully Chablisienne wines that nevertheless seem to be delicious right out of the gate. The wines are marked by their chalky, smoky intensity. A character branded into the vineyards by Kimmeridgian soil. And the professional reviews gush with mineral descriptors for the entire collection on offer: from notes of “oyster shell,” “sea breeze,” and “iodiney minerality” – these are wines as intensely mineral as one could want in a fine Chablis. We’re head over heels for the wines and have a nice selection of these ’17’s arriving early this summer, though you should stock up now because quantities are limited. Want to see all 26 wines from Fevre available for purchase on our webstore? Just click here to view the entire list.